Helen K. Garber, born and raised in Brooklyn, New York, received a Bachelor's Degree in Theatre Arts, Design at the State University at New Paltz, New York. She has lived in California since 1978. In 1991, after a career in theatre scene and costume design, painting, computer animation and video, she documented Le Cirque du Soleil in Santa Monica, Costa Mesa and New York. Since then she has concentrated on still photography. Her portraits have been reproduced in periodicals such as the New York Times, the LA Times, Playbill, Hollywood Reporter, New York Magazine and the LA Weekly. Corporate clients included Hachette Filapecci Publications, The Getty Center, CBS, Penguin, and Doubleday. Helen switched to fine art photography in 2000, and the numerous exhibitions of her work include venues such as Houston Center for Photography, Houston, TX, Tepper Takayama Fine Arts, Boston, MA, Sotheby's , Beverly Hills, CA, UBS Paine Webber Gallery, NY, The Norton Museum, West Palm Beach, FL, Hermes Gallery, Beverly Hills, and Kathleen Ewing Gallery, Washington, DC. A 40 foot long version of Night View of Los Angeles, a panorama of the entire city, taken from the helipad of the US Bank Tower, will be exhibited at the 10th International Biennale of Architecture in Venice, Italy from September through November, 2006. Her works are in the permanent collections of The George Eastman House, International Museum of Film and Photography, N,Y, Brooklyn Museum, Brooklyn, New York, Museum of the City of New York, NY, Portland Art Museum, Portland Oregon, and Peter Palmer Archives, Yale University. 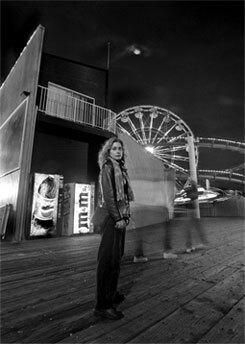 Her publications include "Venice Beach, California Carnivale", Xlibris Books, 2005, Helen K. Garber, Author, "Looking at Los Angeles", Metropolis Books, 2005, Marla Hamburg Kennedy, Ben Stiller, Craig Krull, Jane Brown, Editors, Helen K. Garber, Julius Shulman, Elliot Erwitt, Diane Arbus, David Hockney, Ralph Gibson, others, photographers. and the forthcoming "L.A.Noir", with Robert Morton, former editor-in-chief of Harry N. Abrams, Inc. and Aperture Books.